Today this is short but ever so sweet. We are heading on a little bit of a drive to go pick up our bee nucs. We have three coming and are very excited. We did get honey last year but sadly our 2 queens were weak and the hives did not survive the winter. We again have positive expectations and are starting over. The hives are set up in the back, sugar water is in jars and waiting and now we need to head to the car for our journey north about 2 1/2 hours to get them. I love spring and gardening. 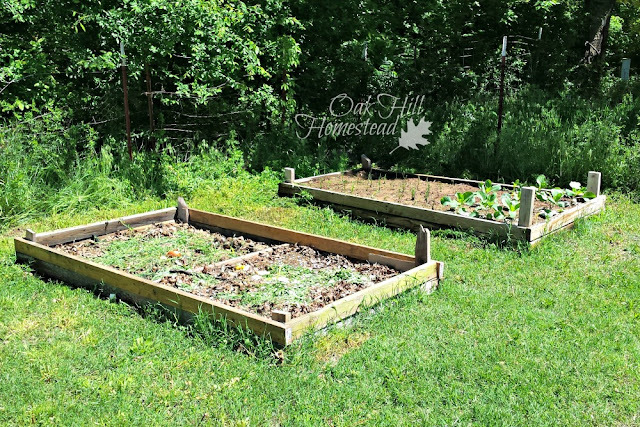 Kathy from Oak Hill Homestead shared on her blog about her garden expansion and beds. Love the pictures and her budget conscience, beautiful build out. I am going to hit the road and ya’ll can get hopping. I will check in later! Happy Friday. First Green Babies Hit the Ground! The rain gave us a break this week which meant some of my green babies got in the ground! This batch had been hardening off and I imagine they were excited to get in the back of Ms. Tupelo to ride back to their garden home. These were truly the strongest bunch of plants I have ever had. They all looked awesome as they went in. I plant so many varieties of tomatoes that I decided to color code them with tie wraps this year. Early in year I can recall my layout. Later in the year when it is a tomato jungle out there, it becomes more difficult to distinguish. The difference between a Green Zebra and Purple Cherokee is obvious but 5 different Romas can become challenging as they all start to intertwine with one another. I also am planting eggplant this year. I hope they do well. I am looking forward to Eggplant Parmesan from these and my tomatoes. Bottom line is that these first green babies are happy to be in and this farmgirl was even happier to get some soil under the nails and sunshine! Weeds, weeds and weeds. AND lots of grass. With all this rain the grass and weeds are taking over. I really am not looking for pristine, but the grass and weeds are taller than my veggies and they are smothering them. Hoeing and handpicking is not keeping up. We clean up and area, it rains and BOOM! They are back bigger and badder than before. We have a lot of garden space and I was getting discouraged. We do not use synthetic chemicals so that was not an option. Hubby decided that getting me back to my happy place in the garden was important. Also growing our own food is important and an investment. He went and bought gardening cloth to put down and has been helping me go through the gardens with it. It is a beautiful thing! We did our first run with this in a garden that was about to be planted. I had planted transplants in one row and they were being overtaken. Tomatoes and pepper transplants were ready to go so we decided here was the best place to start. The fabric is 4 ft wide which is perfect for our spacing here because our rows are 50″ apart. We laid it out, dug holes, added compost and epsom and our transplants. Then hubby laid some straw around each plant and set our cages. The rows look neat and the plants have a fighting chance now. It is a thing of beauty! Next will be Garden 3 which has our beans and cucs fighting for space. They are getting buried by grass. We will mow really short and add the cloth. Pics to come on that clean up! How do you keep the “unwanteds” away from your veggies and flowers? Like many of you we have white surrounding us. But I am deep into garden planning and my plan tells me that I am about to start seedlings! This weekend looks like I will be in the pole barn starting peppers, onions and eggplant. Starting plants is one of my very favorite activities. I blast music, get stuff under my nails and set my babies up for success! Now for the line item that says to start prepping our gardens, hummm….well…. I don’t think so. Covered in new snow as of this morning, with ice underneath. It is going to be a bit before I am prepping outside. But I can start plants inside and I am so excited to do so. The first line on my spreadsheet has the stuff I need to keep in mind in my planning. Most are self explanatory. If you aren’t familiar with the term “persephone” that is when daylight hours dip below 10 hours a day. That is really important for many plants and determines when you start things; especially if you fall and winter garden. My garden plan is in excel (like I have shared before I am a geek) and my garden plan workbook has multiple tabs. In plant varieties, I have specific varieties for each type of plant I would like to grow. Those that are not in green are seeds I already have. Those that are green, started as yellow– meaning that I had to get those. Since I have ordered and received my seeds they are now in green. Inside the companion tab I have plants that are great partners and those marked that should not be together. Yellow indicates same family of plants. In the rotation tab I will indicate which garden each variety gets planted into for the next four years so that they are rotated. Rotation is great for the soil and great for your plants if you are able to do that. Cost is simple– I track each expense so I can see how much I spend. I have not been this formalized in my first two seasons and while I have had many successes, I have also had learnings. Most of those lessons entail just doing something at the wrong time, so I was committed over the winter to get this together. My plan includes reminders on thinning, weeding, hilling tomatoes and sharpening hoes as well. Do you have a formalized plan of some type? Could be post-its, could be on a calendar itself, maybe it is in a notebook because you prefer to write out your plan, maybe you use another tool like Evernote. Whatever you do I think that it is just the planning that is important. Are you in planning mode or planting mode? Green Babies Thriving in my Absence! As you might remember I have some green babies! I started my tomatoes and peppers from seed this year (I am still a novice at this veggie growing thing) and they have been my pride and joy. I have 100+ green babies and some are quite tall right now and getting blooms on them. However, my plans of a weed free, beautifully planted area for these little babies has gotten sidetracked more than once this season. Rain, back issues, cold weather and all kinds of things have side stepped my plans. My traveling has not helped either. Some tomatoes are in the garden–it is not weed free or pristine, but you know what?? They don’t seem to mind. They are thriving and hubby sends me pictures of them growing. These green babies are doing just fine in the sunshine and soil. I can’t wait to see them next week! I still have many to plant. Next week, when I get home I will do that, but for now they are still in pots on my deck. I gave them a good spray of fish emulsion before I left and they don’t look too bad. They are patiently waiting for me and growing while doing so. So, I am late, late with the garden chores. But as a year around gardener (in the making) that is OK! I am reading in my Indiana gardening book that I can still plant beans, peas, squash and all kinds of things in July. Yippee!! When my CSA is finishing up on their cycle, mine will follow. My other bed is full of lettuce, radishes, chard and peas. Those morsels will be awaiting me next week to hop on a dinner plate. Best laid plans… we don’t make them! I love my “distraction” of baby Arlo and my green babies are thriving in my absence and will continue to do so when I return. Have I “got my garden in?” Well some it, not all of it, but if I embrace the idea of growing in a constant state, year around there is no “get my garden in” date. It is only about what’s up today. For me, Arlo is my focus today, the plants are focusing on sunshine and all is right in both worlds.